Over Christmas break from college there is often not much to do near my parent's house. Luckily, the Escanaba, Michigan area is a good place to be if you’re a railfan with little else to do. I spent much of the first week of break following the Wisconsin Central action around town. Every day I checked on the E & LS roundhouse at Wells for action, but the most I caught was an ex-Conrail GP38 parked outside one day. I waited for a couple hours, but the engine just pulled back into the shops, so I gave up. Besides, Escanaba is one of the last hot-spots for Wisconsin Central SD45’s, more interesting and photographic than a grungy ex-Conrail GP38 anyway. The E & LS has a large collection of Baldwin diesels, but only two are operational now. Since I had become serious about railfanning, I had taken many pictures of the unserviceable Baldwins in Wells yard, but never saw one running. The two operational Baldwins are #300 and #202. RS12 #300 is very seldom used, and stays tucked out of sight indoors. 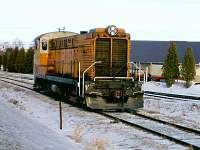 #202, a DS-4-4-1000 in Calumet & Hecla paint, is still operational, and used regular on switching assignments. 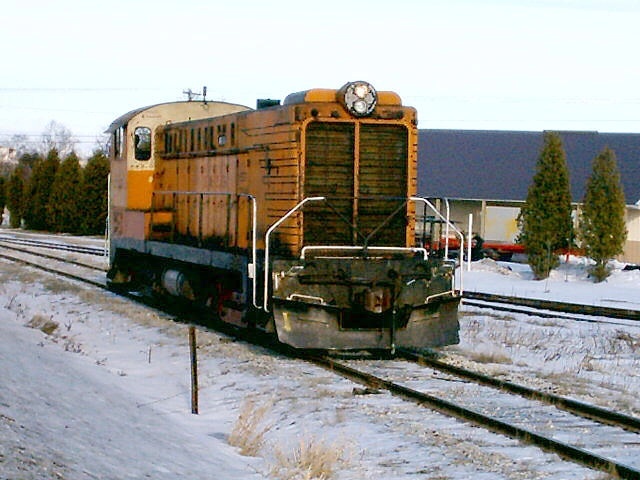 On January 4, 2005 I followed a WC freight-train into Escanaba, then caught sight of #202 scooting out of the roundhouse on the E & LS at Wells. This engine soon became the focus of the day. I went over by the ELS paint shop at Wells, while the crew worked to clean packed snow out of a crossing where they cross the paint-shop driveway. The 1948-built engine sounded great. The crew pulled through a switchback that they use to access the back-door of the paint, shop, then pulled out another gem, RS12 #300. This was a great catch, as this engine rarely sees the light of day now. A garbage truck needed to deposit a dumpster inside the paint shop, so they needed to move #300 to let them in. Once the dumpster was in, #300 was put back inside. N. Escanaba, and switches the roundhouse at Wells. There is only one customer in Escanaba now, DeCock propane, but the ELS car-shops usually keep this job busy. The ELS repairs their own cars, as well as cars for other companies such as GE Capital, to bring in extra revenue. This day, however, the work was light. 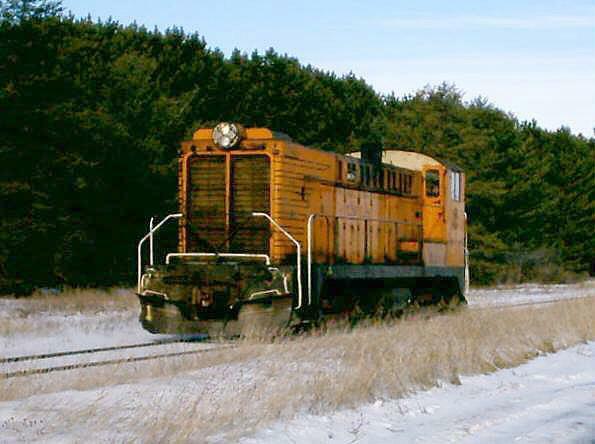 The engine ran light to the WC interchange at N. Escanaba, hauled down 3 empty CIC gondolas, then pulled them up the Escanaba branch to the car-shops in Escanaba. Where cars are usually lined up outside the shops awaiting repairs, today the shops were completely empty. After backing the gondolas in, the engine ran light back to N. Escanaba, then east up the original mainline to the roundhouse in Wells to tie-up for the night. 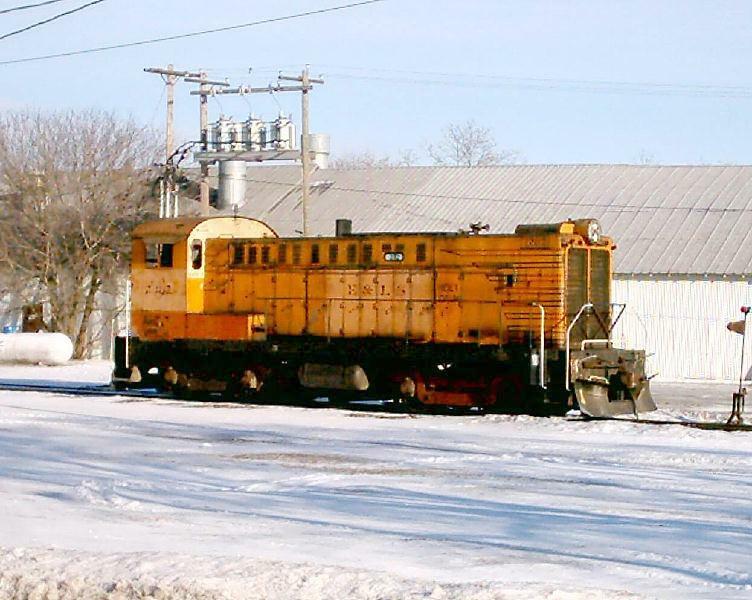 Although the work was light, it is great to watch a 57-year-old Baldwin switcher running on a perfect, sunny winter day. 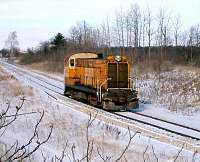 Although the E & LS relies mostly on EMD’s now, they are still a Baldwin road.